my company Splash of Colour contractors is one of Glasgow’s leading Painting and decorating contractors with years of experience in the painting decorating Industry working on domestic and commerce Properties our excellent reputation has been built on paying close attention to detail and word of mouth we only use high Quality Materials and we use airless spray Technology where necessarily to produce a high Quality finish We carry all the necessary insurance, are Highly rated by our clients We pride ourselves on an efficient and friendly service and strive to achieve 100% customer satisfaction. We have the knowledge and experience to provide a comprehensive painting decorating service to our Domestic and commercial clients. The Super Shauns Strike Again! Reading back through the other recent reviews, I can only agree with them all 120%! There just isn't a bad review for a reason. The Shauns first came into our lives last year when we moved house and they painted the whole place for us. We were delighted. They were meticulous, professional and helpful, above and beyond. They are that rare company that really do give wonderful customer service. This was just a small job for them, creating a wonderful effect with two types of paint to make a hallway family proof. I'll have them speed dial for all future painting work and couldn't be more pleased to recommend them. 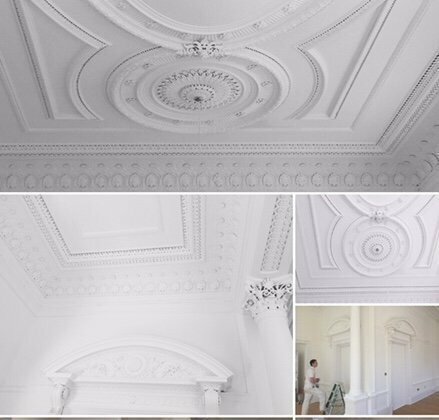 The painting of our communal hall, staircase and very high, intricate ceilings was done to a very high standard. They were extremely tidy and nothing was too much trouble. Problem solving is part of their ‘thing’, and high ceilings and cracks which had other painters talking about scaffolding, were painted beautifully, with a minimum of fuss. Great guys, high standards, very helpful. The guys painted our large hallway, including ceiling, doors and all woodwork. They took great care in prepping the walls and woodwork (removing layer upon layer of old paint! ), and did a fantastic job with the painting. They're passionate about what they do and genuinely want to do a good job - and the end result shows this. Would highly recommend. I had Splash of Colour paint two rooms and two bathrooms in my flat. I was really happy with the end result. Younger Shaun had spent a lot of time preparing the walls beforehand which isn’t something you always get with some painters. The result of this was a first class finish and he has a great attention to detail. He also provided ideas on colours to go for and I was really happy with how the colours appeared on the walls. I found both Shaun’s to be very knowledgeable, trustworthy, polite and they always left my flat tidy. The work was completed within the timeframe of 5 days and was also exactly on budget. They also provided me with a carbon monoxide tester when they thought they could smell gas from my boiler so they definitely look out for their customers! I would highly recommend them to anyone and I would definitely use them again, great job! Contract awarded to fully paint a one bedroom flat in Dowanhill Street. The work carried was to a high standard and regular updates were provided. Shaun McKay and his son are excellent with their workmanship, care and customer service. We were most certainly in safe hands with them, which was important whilst we live in Watford. Thank you once again for transforming our flat, so we can get a good price when it’s put on the property market. Contacted Splash of Colour at short notice to paint a 2 bedroom flat. Shaun provided a quote immediately at a fair price. Started the job as promised the following week and completed in 5 days, painting the whole place top to bottom. I hadn't touched the place for maybe 6 years and they completely transformed it!. Very good finish throughout, can't find fault. Very satisfied with the professional service, quality of workmanship and speed of completion. I would have no hesitation in recommending this firm to anyone. Had Splash Of Colour in to paint my living room. First flat and first time I've had anything like that done before since I moved in. Asked for a quote and was happily surprised! They then came and did a fantastic job. I'm very pleased with the work and their professionalism. Would highly recommend to anyone in the Glasgow area. I asked Splash of Colour to quote for painting eight rooms and a few extra bits, including some paper hanging, prior to moving in to our newly purchased Victorian house. Shaun's was not the cheapest quote but I respected the way he drew attention at the outset to what was needed to achieve a first class and lasting result and I also felt he was interested in the house and making it look its best, and even in the choice of colours. During the work his team were always friendly and relaxed. They were very thorough, paying great attention to detail. The job took a little longer than expected, owing to some worn out areas of plaster that needed replacing before the decorating could proceed. Shaun explained the problem, promptly organised a plasterer and was very reassuring throughout. Despite the delay Shaun stuck with his original quote, as he had said he would and I had regular updates on how the work was progressing. The quality of the work is really excellent. All the rooms look lovely and the finish is amazing, especially given the age of the building. My only regret is that we didn't get the remaining part of the house done at the same time! Thank you very much. A very reliable company which I'm sure we will return to at a future date. I have used Splash of Colour on several occasions, always with complete confidence that the result will be of the highest quality. This time I contacted Shaun with a last-minute job to paint a bedroom and he gave up his weekend to fit us in. I am very grateful for his help on this occasion, as the room is looking beautiful for the person moving in on Friday!